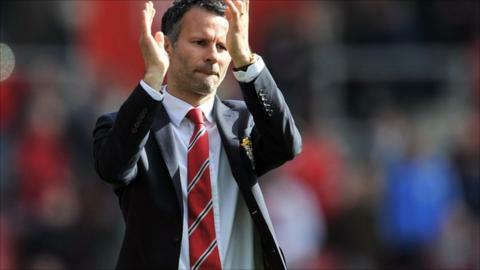 Manchester United's interim manager Ryan Giggs says he expects to resolve his future "within the next week". Giggs, 40, was placed in temporary charge of United following the departure of David Moyes last month. Dutchman Louis van Gaal is expected to take over at Old Trafford and Giggs must decide if he wants to keep playing or take a full-time coaching role. "I'll decide within the next week," Giggs, who has made 963 appearances for United, told BBC Sport. "I think the managerial situation will be sorted out in the next week. I'll think of my own position and decide what I am going to do." Giggs said the options available to him include playing on, staying on the United coaching staff and if so in what role, or taking a year off from football. "These are the decisions I have to make," he said. "All the options are open to me. "I've been quite open with you - I'll look at everything. I might have to do it quick if a new manager is appointed." Giggs' last game as interim manager of United was a 1-1 draw with Southampton as they missed out on a place in next season's Europa League - it will be their first campaign without European football for 25 years - after finishing seventh in the Premier League. The Europa League spot went instead to Tottenham, although Giggs reckons that could prove a blessing in disguise for the new United manager as there will be no distractions to get in the way of their domestic campaign. "I'm quite a positive person so hopefully it will help us in our league form, and we can have good cup runs, which we didn't this year, especially in the FA Cup," he said. The result mean Giggs ends with a record of two victories, one defeat and one draw from his four games in charge and the midfielder added he enjoyed his time in charge. "Management has been an experience - it's been ups and downs. More ups than downs. The down was the Sunderland game. I've enjoyed it. I didn't want that second half against Southampton to end."